On Sunday, March 17, the feast of the Triumph of Orthodoxy, Eastern American Diocesan vicar Bishop Nicholas of Manhattan celebrated Divine Liturgy and led the Rite of Orthodoxy in the Synodal Cathedral of the Sign in New York City. Concelebrating with His Grace at Liturgy was the cathedral clergy: senior priest Archpriest Andrei Sommer and Archpriest Edward Chervinsky, Protodeacons Nicolas Mokhoff and Vadim Gan, and Deacon Pavel Roudenko, as well as Deacon Eugene Grigoriak (cleric of St. John the Forerunner Cathedral in Brooklyn, NY). 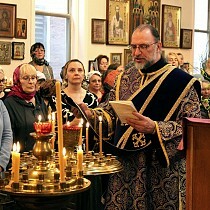 Having finished Liturgy in their own parishes, the following clerics joined the cathedral clergy for the Triumph of Orthodoxy Rite: Archimandrite Elevferiy (Skiba; dean of Our Lady "The Inexhaustible Chalice" Church in Brooklyn, NY), Archpriest Alexandre Antchoutine (dean of Long Island & the Hudson Vally), Abbot Zosimas (Krampis; rector of St. Sergius English Mission at the Synod of Bishops), Abbot Photius (Oulanov; cleric of Holy Dormition Convent "Novo-Diveevo" in Nanuet, NY), Hieromonk Laurus (Solomonov; cleric of "Inexhaustible Chalice" Church). The divine services were conducted under the aegis of the Kursk Root Icon of the Mother of God, which during the coming week will begin its travels to parishes of the Diocese. In keeping with tradition, upon conclusion of the first week of Great Lent, a multitude of parishioners communed of Christ’s Holy Mysteries. Bishop Nicholas congratulated the faithful with the feast of the Triumph of Orthodoxy, and spoke about the origins of this memorial day. 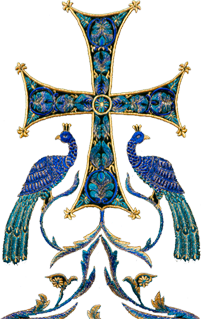 After the Seventh Ecumenical Council (787 A.D.), which confirmed the veneration of icons, the persecutions taper off, but they arose once again, and it was only in the mid-9th century that the iconographers were freed from prisons and exile. In 843, Patriarch Methodius of Constantinople and the Empress Theodora gathered the hierarchs, clergy, and faithful to reaffirm the place of the icons. Orthodoxy was triumphantly restored in the Hagia Sophia in Constantinople on the first Sunday of Great Lent, which in 843 was February 19. Thus were established this celebration and the special rite, called the Triumph of Orthodoxy. His Grace, in part, noted that "today is the day when we glorify our icons. Every Orthodox person should know this day, should have icons in his home, should wear a cross. This is an external triumph, but the most important thing is to honor the holy icons and our Savior, Jesus Christ." Bishop Nicholas called on the faithful to pray and, following the words of the Apostle Paul, to "watch, stand fast in the Faith… and be strong," not fearing to confess the Orthodox Faith. Upon completion of Liturgy, the Rite of Orthodoxy was performed, during which the anathema is proclaimed against all heresies, and the champions of the Orthodox Faith are glorified. After the Rite, His Grace thanked the clergy and choristers who had gathered for this triumphal service, and had majestically adorned them with their singing. The cathedral sisterhood organized a lenten luncheon for all, during which the clergy and parishioners continued their interaction.